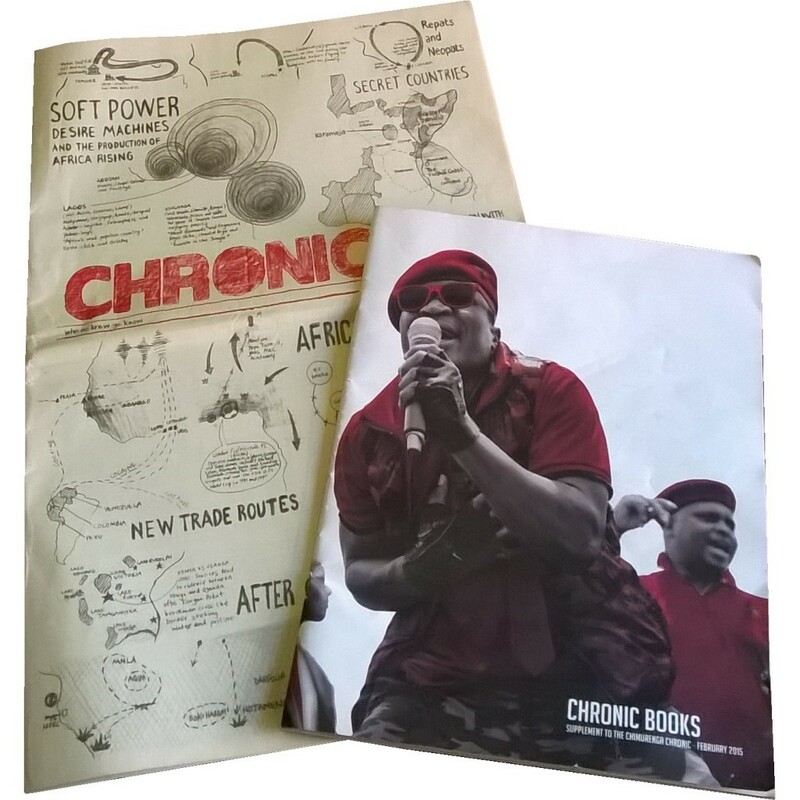 Since its launch in 2011, every edition of The Chronic has engaged with this question: when will the new emerge – and if it is already here, how do we decipher it? But no edition has addressed this query as centrally as our current project on new cartographies. Broadly, the project contests the narrowness of the notion of the “failed state” that publications such as Foreign Policy and various think-thanks mainstreamed at the peak of the structural adjustments of the late 1980s to justify Western interventionism in the so-called developing world. And of course, this notion does not exist in isolation, it is inextricably tied to the idea of development and the resulting instrumentalist logic in which our imagination is imprisoned. These are conceptual frameworks that we, Western-educated Africans who came of age during the 90s have absorbed – it is the thinking that shapes, in the main, our thinking on policy and our imagination of “the good life”. How then does one represent Somalia? Through the Berlin 1884-85-inherited diagrams or through the construct of Greater Somalia, which includes parts of Ethiopia and Kenya? What of the Swahili Coast which extends from Kenya through Tanzania and northern Mozambique to include parts of the Indian Ocean, and whose reluctance to be integrated into any nation-state project other than its own goes back seven centuries? What of the transnational identity of the Tuareg across the Sahel belt – and other pastoralist communities? These questions make visible the existence of “secret countries” that are uncontainable within the borders we know; but there are other queries: what are the new trade routes – for the production and circulation of khat and other narcotics? Or for the export of young males bodies to the football industrial complex? Who fights Africa’s wars? If water has replaced oil as one of the most sought after resources, are we witnessing the dawn of the age of hydro-imperialism? What was the real extent of Gaddafi’s financial empire across the continent? What is the impact of the “neopats” (new migrants from China, India and Mediterranean Europe) or the “repats” (returning Africans) on the continent? The emergence of Boko Haram in the Lac Chad region is a good example of the limit of our current analytical frames. To speak of this movement in the context of contemporary Nigerian politics is to overlook ethno-religious ties that have connected people in that region longer than the existence of Cameroon, Nigeria or Chad. Similarly, to analyze it through the logic of the “War on Terror” is to overlook long-standing local struggles among various groups in the region. We understand the role of cartography as a tool of imperialism. However, we ask: what if maps were made by Africans for their own use, to understand and make visible their own realities or imaginaries? How does it shift the perception we have of ourselves and how we make life on this continent? We do not know, and this is why we’re doing this work. And we’re not doing it alone. We are collaborating with Kwani?, the Kenyan literary magazine. Together we’ve invited writers and artists to produce this language, in words and images. Our aim with this project is to shift the knowledge about and from Africa from “what it should be” to what we experience and imagine it to be – to make visible networks of trade, power structures, movement of people and ideas as we experience them. We are very aware of the specificity of each country – we live in them. But we’re not producing maps of any individual country precisely because we’re contesting the country-focus approach. We’re mapping political, economic and cultural realities that show how dated that approach is, that it has more to do with political correctness and some idea of “post-colonial Africa” than the reality we experience and imagine. Each of the maps represents several places and relations between and beyond countries, essentially, highlighting evolving narratives as opposed to supposedly fixed nodes. 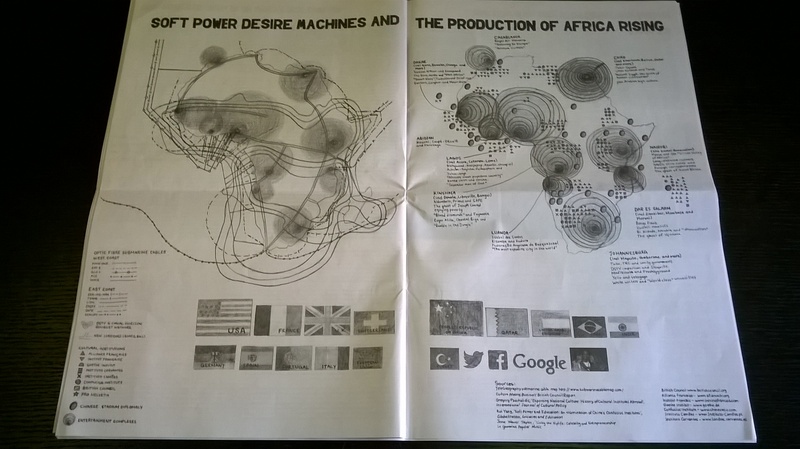 However, these maps are not only relevant to Africans but to the world. As philosopher Achille Mbembe suggests in an interview featured in the issue, “if you want to know where the world is going, look at Africa”. 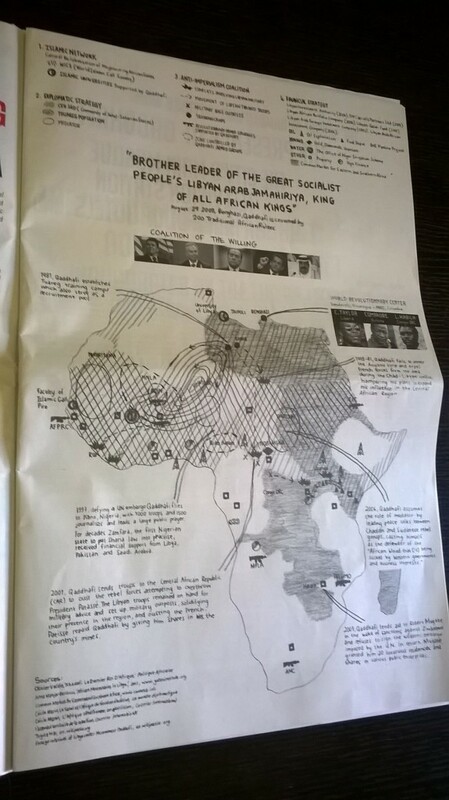 The eight maps we’ve presented here: “secret countries” (Greater Somalia, Royal Bafokeng Nation etc. ); Gaddafi’s financial and military network; soft power (foreign cultural agencies; the entertainment complex and its relationship with the construction of “Africa Rising”); new trade routes (from football to khat); water wars; neopats and repats (new and returning migrants from the West and Asia); who fights Africa’s wars (the fiction of national armies and various players in armed conflicts). Read together with the new writing (memoir, essays, reportage), they invite readers to look at our world differently and to consider what is emerging or re-emerging across the continent (geo-politically and otherwise). This though is by no means the final word. The process is still ongoing and we welcome contributions, thoughts, provocations and reflections. We’re developing a webpage to house the research and ongoing contributions to this project. The aim, as always, remains, to write our world differently.